Save the Salamanders, Save the Spring? 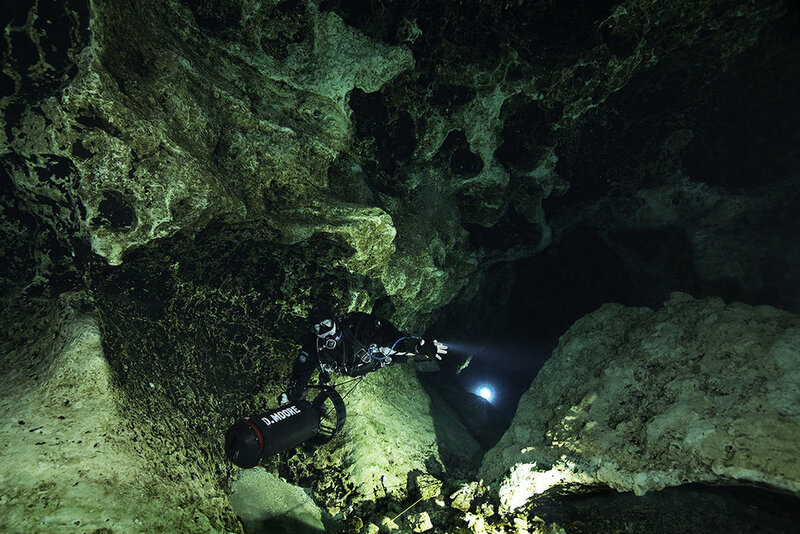 Derek Dulop, a CFL intern, explores Florida’s underground caverns. ﻿When I tell non-Floridians that I live in Florida, they immediately ask me how often I get to the beach or are jealous of how often I must visit the theme parks. Even living in Florida, I feel somewhat disconnected with how other Floridians must experience living in this state. As a wildlife biologist, I spend most of my workday outdoors, and when I’m not working, my free time usually involves exploring underwater caves. Compared with the homogenized developed parts of the state, I feel like many Floridians are missing out on the natural richness this state has to offer. An 8-hour drive from Miami, just 45 minutes south of Tallahassee lies one of my favorite springs, Wakulla Springs. Although seemingly similar to other springs on the surface, the scale of this particular spring is unique in the region. The most notable feature about Wakulla watershed is the vast network of underwater caves, one of the largest in the nation. If one were to unearth the limestone beneath the region, it would likely resemble a giant block of Swiss cheese. A labyrinth of underground rivers and tributaries extending northward to Georgia makes up the Floridan Aquifer, of which Wakulla Springs is a part. Like veins transporting blood throughout the human body, these underwater passages transport water from around the region, with some passages being large enough to hold a jumbo jet. All of the water eventually emerges at Wakulla Springs State Park and flows roughly five miles into the Gulf of Mexico. Locals frequently find relief in the spring’s waters during the hot summer months, but the constant 72-degree water also provides the most northerly shelter to overwintering manatees during the winter months. Manatees rely on the relatively warm spring water to survive when Gulf water temperatures become too cold. Despite somewhat low manatee numbers in comparison to Crystal River or Blue Springs, I enjoyed watching a mother and calf swimming in the basin from the park’s diving platform when I last visited in December. View along the Wakulla River at sunset. Photo by Kari Nousiainen. Later that day, during a boat tour offered by the park, I saw several more, among a few dozen alligators and an array of birds. Similar to boat tours at other springs, the park offers hour-long trips around the upper part of the river. I was lucky enough to experience the last tour of the day, and the setting sun provided great lighting for photographing wildlife. Not to mention, some very large cypress trees! Although the Springhead of Wakulla has long been treasured as a recreational and natural marvel, the water has been under pressure recently due to fertilizer-laced runoff from the Munson Slough making its way into the system. This nutrient-rich water causes the spring to lose its aqua blue color, as it promotes algae growth. Reduction in water clarity reduces the amount of light aquatic plants can receive, causing die offs. At one time, Wakulla Springs boasted the largest colony of Limpkins (a wetland bird that feeds primarily on apple snails) in the world. Now that the aquatic vegetation has disappeared, so too have the snails and, in turn, the Limpkins. As the spring water flows south and mixes with the saltwater of the Gulf, it flows by St Marks National Wildlife Refuge. This diverse landscape houses an abundance of wildlife. However, this refuge is home to one species that is found nearly nowhere else. The Frosted Flatwood salamander (Ambystoma cingulatum) is not the easiest species to come across. In fact, unless you are visiting during a cold rainy winter night you will likely never see one. Ambystomatid salamanders by nature love being underground, and this species, like others, only emerge during winter rains to migrate from the uplands to ephemeral ponds scattered among the longleaf. The Frosted Flatwood salamander (Ambystoma cingulatum) is not the easiest species to come across. In fact, unless you are visiting during a cold rainy winter night you will likely never see one. Photo by Derek Dunlop. Despite only surfacing during winter rains, Frosted Flatwoods Salamanders have become a poster child for proper forestry management and a healthy longleaf ecosystem. They act as an indicator for both properly managed upland and wetland habitat. For decades forest managers have focused their efforts on upland restoration, often needing to burn large amounts of acreage to get the best bang for the buck. Rules and regulations regarding burning have forced their hand to only burn during the wet winter conditions in order to prevent fires from becoming “wild”. Personnel and equipment too often become scarce during the summer months, since they often get sent out west to fight the ever more common wildfires there. This collection of factors has meant that the ephemeral ponds these salamanders and countless other species rely on often never see the fire, which is needed to maintain them, since they are always full of water when the majority of burning takes place. Their relatively small acreage among the landscape, seemingly insignificant, has historically not warranted allocating supplemental resources to burn when dry. However, like a waterhole in the desert, these small habitat fragments have a profound impact relative to their size. Without fire, a diversity of trees including: sweet gum, oaks, and cypress never get knocked back. Eventually they become overly abundant, shading out the wetland and smothering the pond with leaf litter, which slowly breaks down into duff and later peat. It’s this layer of peat that now is coming back to haunt forest managers. Peat fires, once started, can almost never be extinguished. They can smolder for months, billowing smoke into the sky and having the ability to spark new fires if left unchecked. This means that many ponds are now requiring intense and expensive physical restoration. Researchers are working to collect, hatch, and head start salamander eggs in captivity. To date, over a thousand animals have been raised and released back into the wild. Photo by Derek Dunlop. With their historical range once spanning the Southeast, Frosted Flatwood salamanders have been reduced to only a small handful of breeding sites, most located in the Florida panhandle. St Marks National Wildlife Refuge (NWR) boasts one of the best populations. However, the salamanders at St Marks NWR are still in a perilous state, especially after Hurricane Michael. On October 10, 2018, Hurricane Michael made landfall as a Category 4 storm less than a hundred miles west of St Marks NWR. While the refuge was spared the brunt of the storm, storm surge caused numerous breeding ponds to become inundated with saltwater. How this will affect the salamanders is still unclear, but if the salamanders lay their eggs in salty water, they will likely not survive. Now you maybe wondering, how is this salamander linked to a vast network of caves? Well one theory on why Wakulla Springs is turning brown points to the buildup of detritus in the ponds that filter into the Wakulla system. Remember the Swiss cheese I mentioned earlier? By not allowing fire to burn out the bottom of the ponds, the buildup of organic matter has slowed the rate at which the water is absorbed back into the aquifer. The peat is slowly leaching tannins into the water, turning the clear spring water brown. An effect so simple, it’s seen every time you make a cup of tea. Photo of a Flatwood salamander egg by Derek Dunlop. It’s worth a shot! My herpetology professor often exclaimed how amphibians made much better “canaries” than the actual bird in that ‘canary in the coal mine’ saying. Despite the gloomy outlook for the Frosted Flatwoods Salamander, restoration is underway. Researchers are working to collect, hatch, and head start salamander eggs in captivity. To date, over a thousand animals have been raised and released back into the wild. Land managers and governmental agencies are changing their ways and ponds are starting to see fire at the right time of year. Mechanical restoration is also underway and experimental ponds are being restored with the goal of providing additional habitat for head-started salamanders.